Do you know what the difference is between an indoor air cleaner and an air purifier? Air cleaning refers to the filtering of harmful contaminants and particles from the surrounding air. Room air purifiers, on the other hand, are designed to kill airborne microorganisms, mold spores, and other viruses. So-called ionic air purifiers do not, in reality, purify the air at all. This is because they do nothing to kill off airborne microorganisms. The name can be misleading, as they are really air cleaners. A negative ion generator is the main part of an ionizer or ionic air purifier. In addition, guess what - it continually generates and emits a stream of negative ions. Think back to your science lessons in school and you may remember that negative ions are oxygen atoms or molecules that have an extra electron. These negative ions are attracted to the positive particles in the air. Ultimately, both the negative ion and the positive particles join together in the air. This union results in the particles in the ionic air becoming too heavy. Due to their own weight, they ultimately drop from the air to the floor. This removes all sorts of particles from the air. 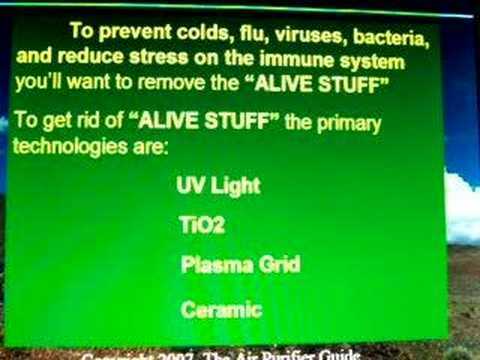 An ionic air purifier is the ideal choice for many people simply because the science behind it seems very logical. Another reason for their popularity is that they use little energy and make no noise. In addition, it is usually unnecessary to change the air filters of ionic air purifiers, unlike many other types of air purifiers. By virtue of the way they work, ionic air purifiers will cause particles in the air to fall to the floor. However, they can also fall to other surfaces in the room. Most, if not all surfaces in the room are positively charged. Therefore, the particles falling from the ionic air are attracted to the room's surfaces. As a result, the area around the ionic air purifier tends to get dark and dirty. While it is true that ionic air purifiers are able to remove airborne particles, the downside is that are easily returned to the air. This can happen because they have dropped onto the floor and other surfaces. Sudden drafts or other movement within the room will easily stir them back up. Ultimately, the harmful particles are returned to the air. In an attempt to overcome this problem, some ionic air cleaners include electrostatic precipitators. They work as a filtration device that effectively traps harmful particles onto charged metal plates. To ensure their efficiency, these metal plates need to be cleaned regularly. Consumer Reports conducted a study into ionic air purifiers in 2005. This research resulted in the conclusion that ionic air purifiers did not actually work when it came to air cleaning. In addition, they found that an ionic air purifier could actually add harmful levels of ozone to the air. In high enough levels, ozone has been found to be toxic. In fact, studies suggest that ozone can cause damage to the lungs and the respiratory tract. If you want to keep you air healthy, an ionic air purifier is probably not the best answer. In fact, your goal should not be to clean the air after it becomes unhealthy. In other words, why not try to keep the air healthier in the first place. Doing away with carpets and rugs, which harbour all manner of pollutants, is a good first step to healthier air. Another good tip is a stop burning scented candles and incense sticks inside your house. It is also good advice to install outdoor venting fans in the kitchen and bathroom to help air circulation. Whenever possible, give your house a good airing by opening windows. These natural air purifier techniques will work better than any ionic air purifier on the market will.